NEW! THIRD GENERATION-B MODEL: Now includes battery compartment door, long range 12-button remote, PLUS another exciting feature - the 3G-B receivers can be set to begin at any cue on the transmitter. 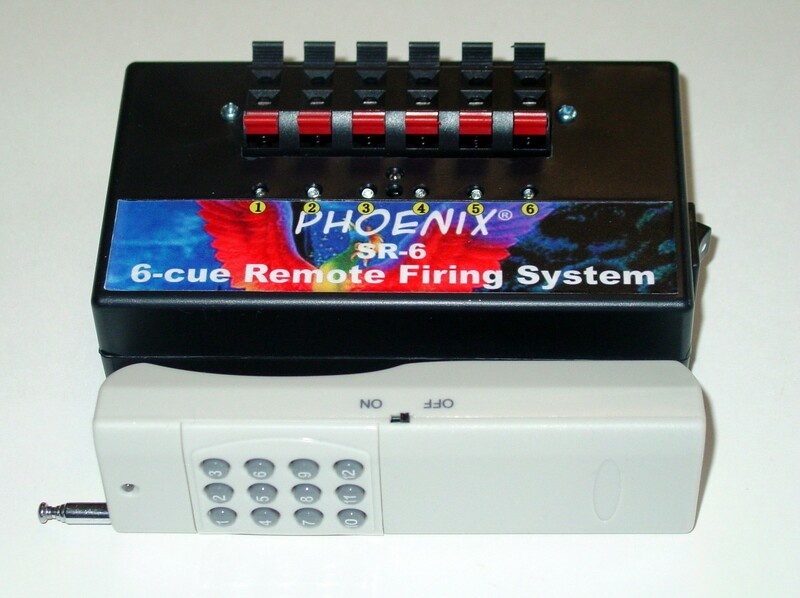 For instance, the SR-4 receiver can be paired to fire cues 1-4, cues 2-5, 3-6, 5-8, or cues 9-12, etc. You can now purchase extra SR receivers to expand your system. For instance you may combine one SR-4 and one SR-8, three SR-4, or two SR-6. In addition, the SR receivers are now compatible with the MR receivers. MR receivers can be programmed to operate in unison with your SR receivers to likewise fill in extra cues or fire simultaneously. The SR 3G-B systems are more expandable and versatile. This system is very well suited to rocketry, R&D Testing, small displaysor any other need for a compact multi-cue wireless system. Robust and stable- economically priced.